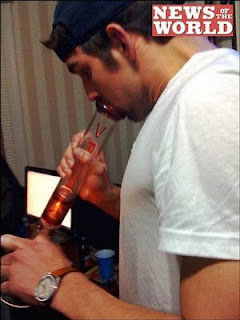 "IOC accepts Phelps' apology for marijuana photo"
Oh, for chrissakes, what are we infants? Why does he have to abjectly grovel and apologize? He took some pot. Not during the Olympics, not in the middle of the Olympic Village. At a party in his private life. So what? Give me a break. If he had been pictured chugging tequila, no one would have thought twice about it. And it's not like pot could be considered a performance-enhancing drug, even if it had been around the time of a swim meet. I don't smoke, but stop with the marijuana panic, already. How much money is wasted on the "war on drugs" every year? Didn't we learn anything from Prohibition? That really worked out well, didn't it. It was the beginning of the rise of organized crime in the U.S. and we've done the same thing over the last few decades now with drugs. I think it's because he's a role model to kids. But I agree the double standard between alcohol and pot is crazy. When did being an athlete make one a role model? There are so many MORE important things going on in the world than embrassing this man for smoking pot. I am totally anti-drug, never touched the stuff, never will. However many people will and have. That doesn't make she/he necessarily bad. What bothers me is the the same media that damns Phelps is out there selling media products that glorifies pot use. As a parent you should be able to explain to your child the truths about life. My opinion of Phelps doesn't change. He's a good swimmer and won some medals. Okay, now let it go. Thanks for letting me rant. They are saying he might get arrested now! Agree with the other poster though - why do we make role models out of athletes and movie stars? Shouldnt that be the parent's jobs? The guy trained and lived like a monk for 90 % of his life, let him have some fun.